Reanjoy Laboratories followed quality management as per ISO 9001:2008. We are professional DCP manufacturer in low fluorine premium feed grade. Our service is based in Udaipur for convenient supply in the home market. We also deliver exporter services and supply to a growing pan-India market. Majority of our clients are not only in Rajasthan, but also in the neighboring Gujarat, Haryana, Punjab, Madhya Pradesh, utter Pradesh, Andhra Pradesh, Tamilnadu etc. Our production unit employs state-of-the-art manufacturing process to develop rock based quality dicalcium phosphate. Our primary concern is quality. We value the health aspect immensely and keep it as the guiding business principle in all our efforts. Dicalcium phosphate is an excellent balanced source of calcium and phosphate. Calcium serves several vital functions in the animal body, including improving bone strength and muscle contractions. As a result, livestock owners can increase their productivity with healthy animals. Some of our privileged clients are traditional livestock owners, and look for a real professional service for best quality products. Contact our supplier service to make sure you have the best. The low fluorine content production in our product range is highly suitable for cattle with weak digestive systems. Essentially, as a concerned provider, we always keep our mind that the product would eventually find its way into a human body, and it should be safe for animal consumption as well. 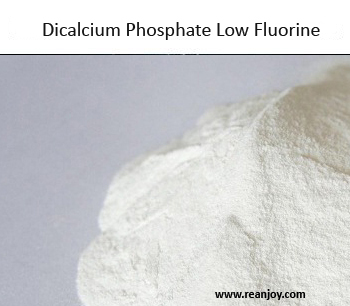 Why Dicalcium phosphate low fluorine feed grade is preferred? Fluorine found regularly in teeth and bones but when inject in too large amount in animals feed appear toxicity in enamel of teeth so this cause of rapid wearing down of the teeth and animal are unable to eat. Mainly Bone and teeth injuries are characterizes of fluorine toxicity. Generally Fluoride compounds which have more water solubility have more toxic. The inorganic salt of fluorine is more toxic then organic compounds. Sodium fluoride has highest bioavailability after oral ingestion. Maximum rang up to 2000 ppm of fluoride in Calcium fluoride digestion of animals show toxic problem for animals. Fluorine - Less than 1000 ppm ( IS 5470:2002) – As per customer requirement we produced low fluorine contain in rang of up to 1000 ppm also.